As I wrote a couple of days ago over on Just Bento, I recently spent a scant 3 days in Paris, on the way from Brittany back to Zürich. A normal person would spend such a short time in the gastronomical capital of [insert your favorite geographic superlative here] exploring la cuisine française. But my objective for this trip was different. My digestive system and palate were rather exhausted from 2 weeks of consuming the delicious salty cultured butter, crême fraiche, galettes (crêpes), seafood in creamy sauces, and oh yes, pastries to die for, all washed down with cider both brut (dry) and doux (less dry), that are the specialities of Brittany. I was craving the plain white rice and tea like you wouldn't believe. There seem to be three major concentrations of East Asian food in Paris. One, and the biggest, is the Chinatown area in the 13th arrondissement. Then there's another enclave of sorts in the 15th arrondissement. But for tourists with little time, like myself, the most convenient area especially for Japanese food is the area that straddles the 1st and 2nd arrondissements near the Opéra. Every other storefront on certain streets there seem to be either a Japanese restaurant, or a Japanese-oriented store. 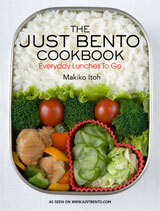 You do need to take a good look at those allegedly Japanese restaurants though. I have been reading a lot of Japanese expat bloggers (and there are quite a lot of them in Paris), and most complain that these so-called Japanese restaurants are not good. Not all are run by Japanese people or have Japanese cooks. That does not of course preclude an establishment from not being good, but I guess you could say that the odds may worsen. So, the best thing to do may to just follow the crowds. By 19:00 (7pm), the popular restaurants are crammed full. Some even have lines around the block. 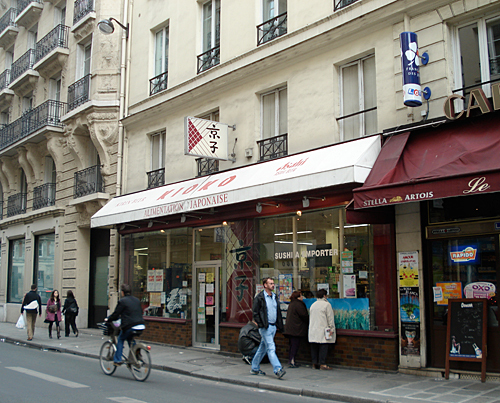 The center of this Japanese community in Paris is arguably Kioko, a small grocery store that's been in business for 37 years. There are also Korean grocery stores that carry a lot of Japanese food. 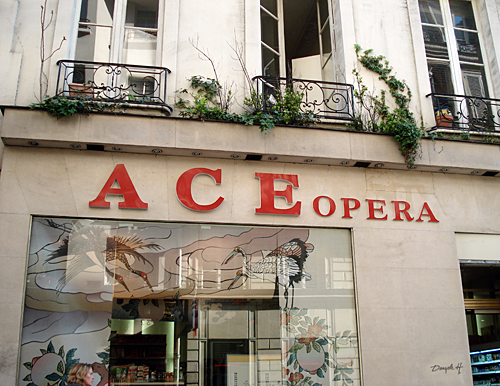 Here's Ace Opéra. I found their prices to be a tad cheaper for things like bottled green tea compared to Kioko and the bento store Jujiya. So, what did I eat? Well, the best cheap food I found in the area (besides takeout bento) was ramen. We tried a couple of places, and weren't disappointed at either. Here is tonkotsu ramen (pork bone soup ramen) at Sapporo Ramen. The soup was very good, the noodles could have been better. But then, this is Paris, not Tokyo, and I was happy. 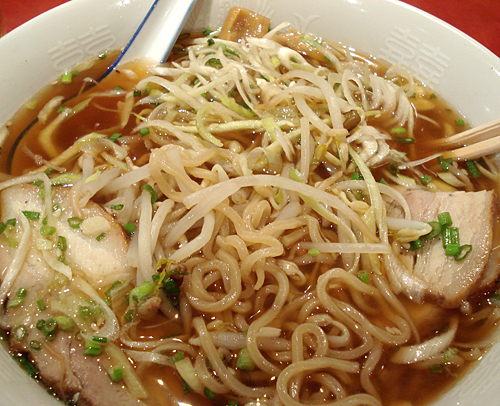 And here's negi ramen (ramen with lots of sliced leeks) at...I think it was Higuma. Again, soup was fine, the char siu a bit fatty but good, noodles could have been better, but was still ok.
A bowl of ramen on its own is around 7 to 9 Euro; as a set menu with gyoza dumplings and such, it's around 12 to 14 Euro. It compares favorably to set menus at French restaurants in the area. We did venture out beyond the Opéra Japanese area. 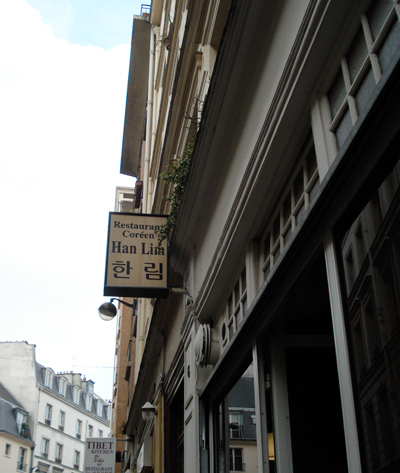 Following up on a rave review on a Japanese blog/site aimed at expats and tourists, we sought out some Korean fried chicken at Han Lim, an established Korean restaurant in the 5e, right off the Rue Mouffetard at the Place Contrascope. I wasn't able to stay 100% focused on Japanese/Asian food. I couldn't resist a stopover in the Marais (my excuse: I wanted to check out the newer bento boxes at Muji) for a Middle Eastern food fest at Chez Marianne. 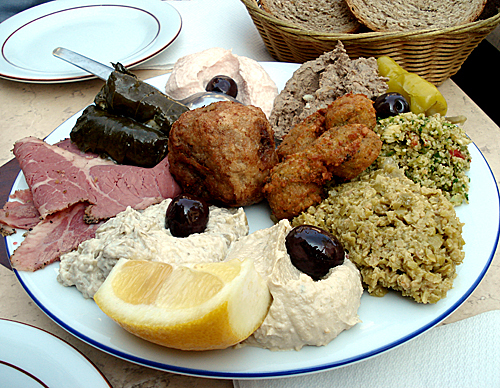 I am not sure what I like the best: the tarama, the falafel, the bland yet oddly addictive chopped liver, or the green olive tapenade. It's all good though. With a big basket of bread it's 12 Euro per person. As I write this and look over my photos, it really strikes me that there's something seriously wrong about the last sentence in this article about Paris 'never embracing other cuisines'. Maybe not by the kind of people who participate in Zagat surveys, but judging from the lines forming around ramen places and okonomiyaki places and falafel places and more, it seems clear that many other Parisiens are embracing good food, whatever the origin. I would argue that people who are used to good local cuisine are likely to know what good 'other' cuisine is as well. In any case, now that it looks even more likely that I'll be moving to France, I'm looking forward to exploring Paris and its inexpensive yet good 'other' cuisines as often as I can. 3 days was far, far too short. 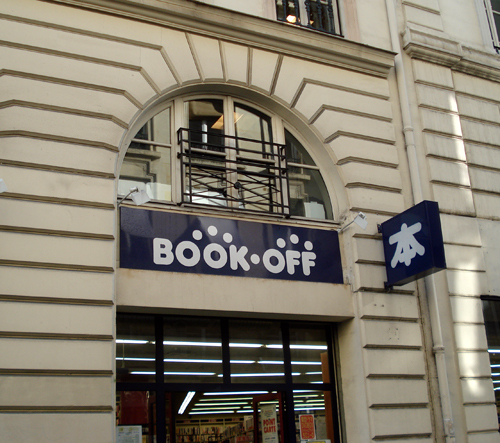 Next time, I'll be talking about a very special Japanese store in Paris, one that's not quite frugal. 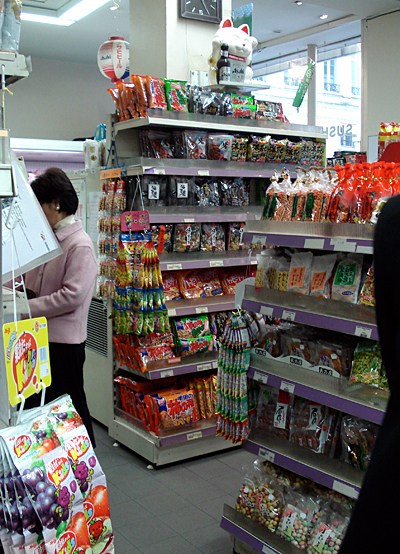 The grocery stores are all listed on the Japanese grocery stores in France handbook page. Korean restaurant. Has all the usual things - barbeque, soups, etc. 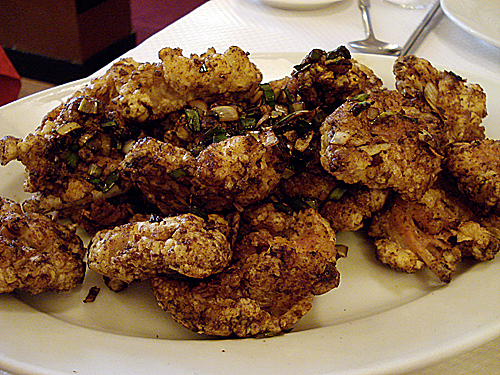 The fried chicken is a house speciality. Yum! There are many ramen stores in the Opera area; here are just two. Look at the menus in the windows, judge the number of people inside and waiting in line, and dive in accordingly. Ramen (or as they spell it on the storefront, Lamen) restaurant. Japanese spoken. Middle Eastern restaurant; a few tables, plus a takeout window. 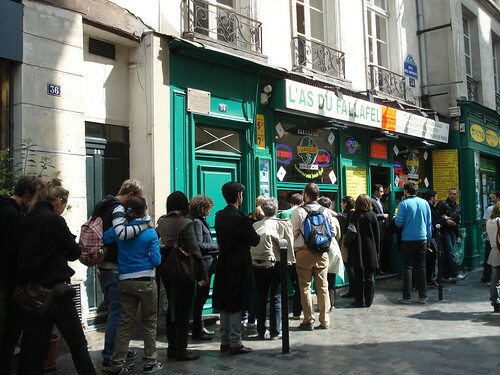 L'As du Falafel is right around the corner on Rue des Rosiers. For a report on a definitely not cheap Japanese food store in Paris, see Workshop Issé. Submitted by maki on 2009-04-16 21:54. Gosh, these posts are making me ache for Paris. If there's one regret I have for the months I spent there, it is that I was a poor student and didn't really enjoy food as much as I should have and would have liked to. Knowing what I know now, I'm going to make sure that the next time I go, if I do, that I have enough saved up to enjoy any eating out at any place that seems good (cheap or not), even though I'm usually more of a home-cooking kind of gal. Thanks for these scrumptious slices! Would it be OK to speak Japanese in those Japanese stores? I know some Japanese stores aren't owned by Japanese people. I don't speak French at all, but I would like to go to Paris one day and my husband would like to go back. In the Japanese owned stores like Kioko and Book Off, you can definitely speak Japanese. Likewise with the Japanese owned restaurants. Otherwise they can probably speak a little English. Don't be afraid of not speaking French in Paris! Most tourists don't I think. A few words (bonjour, merci, etc) would be nice to know of course but otherwise you'll be fine. We went for a tiny but homely looking little place with room for very few covers at a time. Sadly I forget the name, though have it written somewhere. seriously, Higuma is not very good... I've been eating in this street for ten years. Kinutoraya is almost just in front of it and is owned and run by japanese people. They make mean Dombunri! Aki (Yakitori) and Naniwaya up the street are above it in my opinion. Globally the quality of the food in this street has decreased, as it became more popular, you'll have better surprises scouting around in Paris for small, family restaurants..
"...Like the Matchan for exemple, small and hidden in the 15th district, but always full of japanese families feasting on gigantic amounts of food..."
Could you please provide an address (or two, even!). I live in the 15ème arrondisement and would love to have some good advice on some of these little family restos...especially japanese. I'm so hungry right after looking at these photos. God, I can't recall the last time I had ramen soup. Just got first passport a few months ago. I want to go to Paris real bad now. 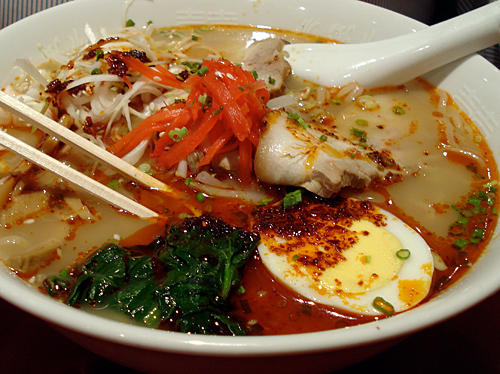 The ramen looks very tasty. Just an aside... I spent 8 days in Paris in 2003. At that time, at least, there was actually a KFC there... near Les Halles. I'm ashamed to say I indulged in it (after a very trying evening before trying to order a 3 course dinner in french and getting all the wrong items). Additionally, we went to a very charming and seemingly authentic (Irish bartender!) Irish Pub in Montmartre, very near Sacre Coeur to hide from the rain in February. Our most memorable authentic (?) french meal was actually a lunch we had at Musee D'Orsay... in a *beautiful* dining room. I have to admit to having a McDonalds or KFC (as in Kentucky, not Korean...) attack on occasion in France too...McD is everywhere, KFC not so much. After a McD meal I always regret it...but then I go back some time later...it's a very odd thing really. Funny how it sort of pulls you in, with that siren call of french fries in the air...(although, my bf understands that once in a while, I just need a dose of american fastfood). Mr. Zagat, as the french might say, "a fumé de la moquette". Maybe the Zagats need to come back to Paris and live here a while to see that the city has changed since the last time they lived here in the'60's. 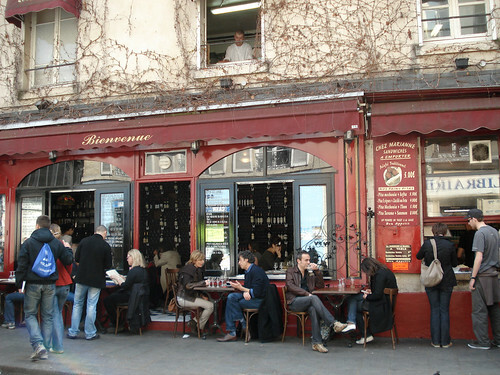 The beauty of Paris is that you can dine on cuisine from all over the world. This can be attributed to the great enthusiasm the French have for cultures other than their own. Why do you suppose, for example, couscous is as ubiquitous in almost all brasseries and household in this city as a bifsteck? Or as you noted people wait in line to get into a Japanese restaurant? I am always pleasently surprised by the sheer diversity of cuisine I can find in Paris. Even some very strange hybrids (Mexican-Indian anyone?). I would be happy to share any recommendations if you'd like. I also prefer Aki at St Anne str. I'd be glad to get to know the places you like! Thank you! Neat, this makes me interested in studying abroad in Paris. I thought I'd not be able to survive with just French food, but it seems like there is a good variety of food! The best place serving Japanese noodles in the Opéra/rue Ste-Anne area is Kintaro, in my humble opinion. Across the street from Book-off. It's cheap and delicious. The sushiya I like most is Toritcho, rue de Montparnasse, on the Left Bank. Run by Kansai people. Even the omelette and the rice are perfect. 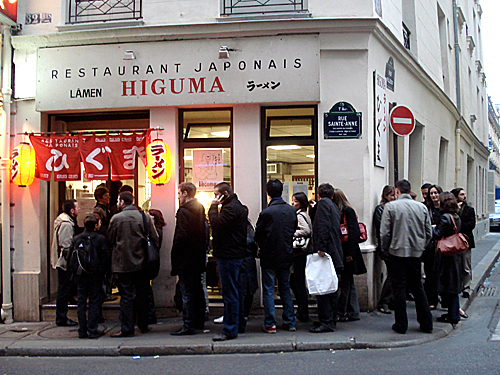 99% of the Japanese restaurants in France are Chinese-run places serving sushi and yakitori. The problem is not the owners being Chinese, the problem is that they don't seem to know anything about cuisine and cooking in general. You can easily identify the good restaurants in Paris, look at the labels on the door. If you see only Amex Welcome and Visa/Mastercard, it's most probably not worth a visit, or it's a real, real hidden gem. If you see recommendation labels from several gourmet guides (like Zagat), you can be sure it's worth a try. There is a Comité d'Evaluation de la Cuisine Japonaise which lists (and labels) the best genuine Japanese restaurants in Paris. The 2007 list is here: http://www.cecj.fr/ . Also Jethro and some expat blogs publish such recommendations. You can pick up Jipango in many Japanese restaurants. I don't know of any nice Japanese restaurants in the two Paris Chinatowns. You're perfectly right concerning the groceries, the Korean ones carry the same stuff, but are significantly cheaper. 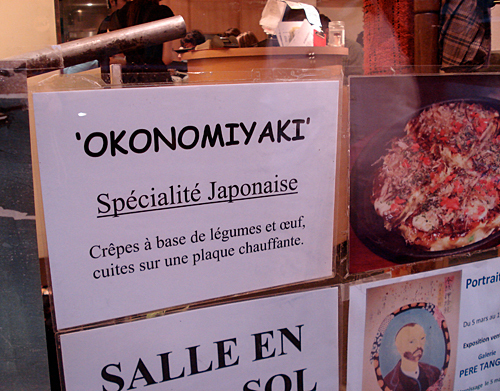 Okonomiyaki is hard to find, I know two places in the 17th arrondissement. There is a widespread interest in all things Japanese in Paris, from manga to sumo. Former President Chirac went to Japan 52 times, mostly incognito. The article you're referring to is obviously BS. The only city on Earth offering a similar variety and such an easy-to-find quality dining is Tokyo. Even if there are many other big cities where the food is amazing, Singapore for example. I have spent one year of my life in London, it's a cool place, but ordinary people are genuinely, deeply uninterested in what they eat. This is not necessarily a bad thing, as I don't live there. As a person of Chinese cultural origin, I was a bit disturbed to notice the chopsticks sticking out of the bowls in both the noodle pictures, as that is considered impolite according to Chinese ettiquette. I took the pictures just as they were being eaten, so that's not impolite unless you eat noodles with your hands! Thanks so much for the info! I'm currently in Paris working, my last weekend off tomorrow and I really wanted to find some place like this! Well, eatin Japanese food in the middle of Paris is like going to Italy and bringig piza with you! :-) I like Japanese food also, but when I'm in Paris, I enjoy eating domestic specialties, and Francham have really good specialities! Higuma had big, light blue and looking old, bowls... I don't think your pics are from higuma! I am a man of 45 years,origin from India.I always dream to meet Japanese friend in Paris. I like Japanese culture and food etc. It is not easy to speak Japanese people in Paris.But I want to take chance here. I hope some one will contact me.Prefrence is female.